During pregnancy, healthy weight gain is normally 15 to 35 pounds depending on the expecting woman’s starting weight. Healthy weight gain is attributed to the weight of extra fluid, blood, the placenta and the fetus. When a healthy pregnancy diet is adopted during gestation, weight gain will be gradual and extra weight will shed naturally after birth. Dieting and weight loss are not healthy for the growing fetus or the pregnant woman. Diet pills typically contain stimulants that increase heart rate in order to achieve higher calorie burns throughout the day. The most common stimulant used in diet pills is caffeine or Guarana, a caffeine-based herb. 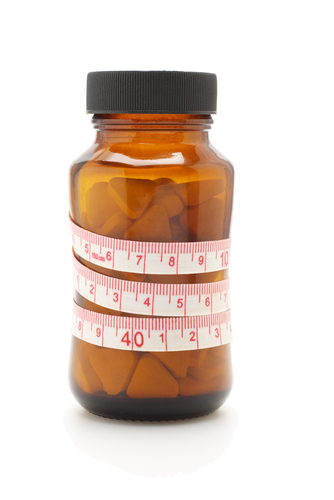 Diet pills are not approved by the Food and Drug Administration and can include any combination of natural herbal stimulants in order to achieve weight loss. Diet pills are not safe for use during pregnancy. When a pregnant woman does not gain weight naturally throughout a pregnancy, she can inhibit healthy growth of the fetus. Caffeine is also associated with a higher risk of miscarriage, which means diet pills could cause the fetus to spontaneously abort during the first few months of pregnancy. In order to maintain a healthy weight gain, pregnant women can choose to increase caloric intake with whole grains, fiber rich foods, fruits and vegetables. Lean meats are a great source of protein that can also be used for the extra 300 calories per day needed during pregnancy. In certain situations, a healthy pregnancy diet will cause weight loss. This generally occurs when the pregnant woman is overweight or obese when she becomes pregnant. Weight loss during pregnancy is considered safe in overweight and obesity cases as long as the expecting woman is consuming enough calories to maintain healthy fetal growth.